Herbal combination that provides soothing comfort to energize you for the day ahead. One glass of drink mix for all-day energy.† Improved flavor! Enjoy the great flavors – choose Tropical Citrus, or Berry Splash! Each morning, take 1/2 to 1 scoop, or as recommended by a healthcare professional. For 1/2 scoop: Mix with 4-6 oz water, your favorite beverage, smoothie or yogurt. For 1 scoop: Mix with 8-12 oz. Best if consumed within 30 minutes of preparation. This product contains the amino acid Phenylalanine. If you are pregnant, nursing, have a blood clotting disorder or are taking any medications, consult a healthcare professional before use. 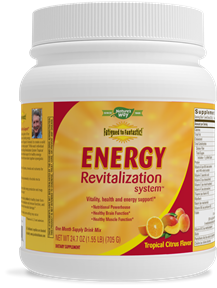 Fatigued to Fantastic! Energy Revitalization System was formulated with Jacob Teitelbaum, M.D., recognized energy expert and author of From Fatigued to Fantastic! The whey protein concentrate provides a minimal amount of dairy products, namely, lactose and casein. It contains a maximum of 7% lactose and 15% casein. This calculates to a maximum of 0.6 grams of lactose and approximately 0.9 grams of casein per serving of Fatigued to Fantastic! Energy Revitalization System. For comparison purposes, there are 10 to 16 grams of lactose in an 8-oz glass of milk. Due to the extremely small amount of lactose and casein in Fatigued to Fantastic! Energy Revitalization System, dairy allergies should not be aggrevated in the majority of individuals. However, those who are sensitive to even the smallest amount of dairy protein should not use this product.